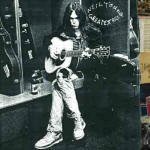 Neil Percival Young (born November 12, 1945, Toronto, Ontario) is a Canadian singer-songwriter, musician and film director. The Youngtown Museum is named in tribute to one of Canada's most outstanding Singers , Songwriters, and Musicians ... Neil Young. Neil spend his early childhood in the village of Omemee and the Young Family history continued in the area through Neil's father (Canadian Journalist and Author) Scott Young who lived near town until his passing in 2005. 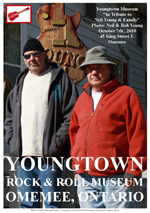 The museum is not directly affiliated with Neil Young or his family but pays respects to the artist and his family through an amazing exhibit of memorabilia, photo's, and music. Young's work is characterized by deeply personal lyrics, distinctive guitar work, and signature falsetto tenor singing voice. Although he accompanies himself on several different instruments—including piano and harmonica—his style of claw-hammer acoustic guitar and often idiosyncratic soloing on electric guitar are the linchpins of a sometimes ragged, sometimes polished sound. Although Young has experimented widely with differing music styles, including swing, jazz, rockabilly, blues, and electronic music throughout a varied career, his best known work usually falls into either of two distinct styles: folk-esque acoustic rock (as heard in songs such as "Heart of Gold", "Harvest Moon" and "Old Man") and electric-charged hard rock (in songs like "Cinnamon Girl", "Rockin' in the Free World" and "Hey Hey, My My (Into the Black)"). In more recent years, Young has started to adopt elements from newer styles of music, such as industrial, alternative country and grunge, the latter of which was profoundly influenced by his own style of playing, causing some to confer on him the title of "the godfather of grunge". Young has directed (or co-directed) a number of films using the pseudonym Bernard Shakey, including Journey Through the Past (1973), Rust Never Sleeps (1979), Human Highway (1982), Greendale (2003), and CSNY Déjà Vu (2008), a documentary about the band's controversial 2006 "Freedom of Speech" tour. He is currently working on another documentary about new technology for automobiles, tentatively titled "Linc/Volt". He is also an outspoken advocate for environmental issues and small farmers, having co-founded in 1985 the benefit concert Farm Aid, and in 1986 helped found The Bridge School, and its annual supporting Bridge School Benefit concerts, together with his wife Pegi (in this, Young's involvement stems at least partially from the fact that both of his sons have cerebral palsy and his daughter, like Young himself, has epilepsy). Although Young sings as frequently about U.S. legends and myths (Pocahontas, space stations, and the settlement of the American West), as he does about his native country (such as in "Helpless" and "Four Strong Winds"), he remains a Canadian citizen and has never wanted to relinquish his Canadian citizenship. He has lived in the U.S. for "so long" and has stated, about U.S. elections, that he has "got just as much right to vote in them as anybody else."